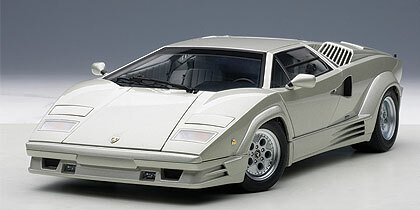 Only 658 of the anniversary edition cars were made between 1988 to 1990, all featuring Lambo’s massive 5167 cc mid-engine V-12 and representing Countach styling at its zenith. The car went out of production in 1990 as Diablo was launched. 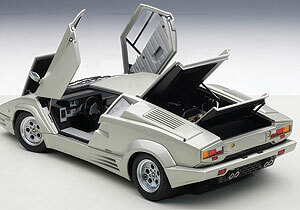 Countach ran on a 98-inch wheelbase was 163 inches long and weighed just 3,285 lbs. as it rode on a tubular space frame with aluminum body panels. That light aerodynamic shape translated into a top speed of 183 mph and a 0-60 mph time of 4.7 seconds. Autoart’s model is equally impressive as the 1:1 version was in its day, both in looks and fine details. Let’s start with the numbers. This Lambo consists of 325 parts, 60 metal, 19 photo-etched and 18 zinc die-cast. Creases, body panels and seams around opening scissor doors, hood and engine cover are beautifully executed. Hinges on these opening parts are strong and realistic. Door-mounted mirrors are mirrored, the headlights roll up and retract, and badging and lights are proper and realistic. Yet the 25th Anniversary Countach stands out from earlier models due to the air-box intake duct work on the rear quarter panels above and behind the doors. These are more gradually angled and the fins atop the rear ducts run longitudinally instead of side-to-side. This looks better and the change in design was helpful in cooling the V12. Scissor doors with NACA ducts that spread to the rear fenders are impressive too. And there’s a lower section that looks almost like a small shelf around the car starting from the doors and running across the back as a small rear bumper. 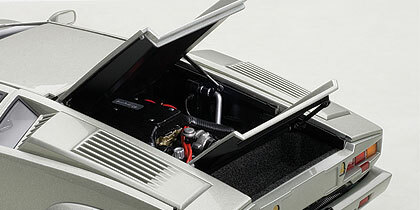 For the anniversary model Lamborghini created a better looking single-piece engine cover with six sloted vents and a bulge to indicate the bodacious V12 underneath, here with proper red wiring to each of the 12 plugs. Autoart creates a nicely detailed engine without going overboard. Inside, easily viewed if you flip those scissor doors open, is gray and black, the seats looking plainly modern, but with proper cushion contouring. There are black shoulder belts and the black dash’s main instrument cluster is raised and includes accurate gauging. The dash is loaded with molded-in air vents for that massive windshield too. The steering wheel is a stylish 3-spoke black wheel with gray hub. Finish is flawless, this model receives 106 free-hand sprays, and is what you’d expect at this price point. Wheels and tires are attractive and look authentic, but there is no branding on the tires.